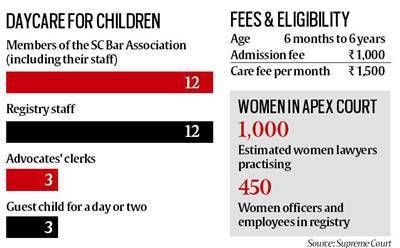 Although the Supreme Court's crèche is primarily aimed at women who work in the Supreme Court, it is also open for men who bring their children to work. Last week, the Supreme Court opened a 2,000 sq ft crèche, a huge improvement from a two-room childcare centre earlier functioning from outside the complex. Although it is primarily aimed at women who work in the Supreme Court, it is also open for men who bring their children to work. Do face masks really block PM2.5? An international team of researchers found significant variations in the quality of the masks depending on where they were purchased. Why does a US Congressional panel think the Pacific Command should be named ‘Indo-Pacific Command’? The House Armed Services Committee of the US Congress on Friday proposed that the US Pacific Command (PACOM) be renamed as ‘Indo-Pacific Command’. The proposal was part of Chairman Mac Thornberry’s ‘mark’ — the starting point of legislation that is then taken up for debate and amendments by the Committee — for the National Defence Authorisation Act (NDAA) 2019. The ‘mark’ also proposed to rename the Southeast Asia Maritime Security Initiative — a Defence Department-funded security assistance programme for US allies in Southeast Asia — as the Indo-Pacific Maritime Security Initiative, and to add India as a covered country. NDAA 2019 needs to be passed by the Armed Services Committees of the US House and Senate, and thereafter by the House and Senate, before it is signed into law by the President. Will Karnataka polls impact market? In spite of rising US interest rates, and oil prices, economic indicators suggest a strong growth across various sectors. The Karnataka Assembly Elections will be considered a precursor to the 2019 general elections by the market. However, a year is too long a period in politics, so the impact may be transitional if the events unfolding after the polls indicate a contrary trend. The Indian market is facing deteriorating macros with higher oil prices and rising US interest rates amid global trade wars. Rising crude prices can impact India’s twin deficits — trade and fiscal — adversely. 2 What lay behind Thimayya-govt friction? 3 How far will aid for sugar go?